The evolved form of Reit and a new support card for Duo Decks that need specific Vanguards appear together! AUTO (VC) Limit Break 4: [Counter Blast 1 & Choose 3 cards with the same name as this Unit from your hand, discard them] At the end of a battle in which this Unit attacks, if you have a “Duo” Heart Card, you can pay the cost. If you do so, place this Unit face-up in the G Zone, then choose up to 1 face-down “Duo Everlasting, Reit” in your G Zone, Stride it to (VC) at Stand, it loses Drive-1, and loses all AUTO abilities. AUTO (VC): [Soul Blast 1] When your turn ends, you can pay the cost. If you pay it, you can choose 2 or more “Duo” cards with the same name from your hand, reveal them. If you reveal 2 or more, search your Deck for up to 1 Grade 3 “Duo” card from your Deck, except “Duo Sprinkle Light, Prianny”, Ride it on (VC) at Rest, then shuffle your Deck. If you Ride it and you revealed 3 or more cards, Draw 1 card. • The 《Bermuda Triangle》 “Duo” enhancing ace G Unit, “Duo Everlasting, Reit”! 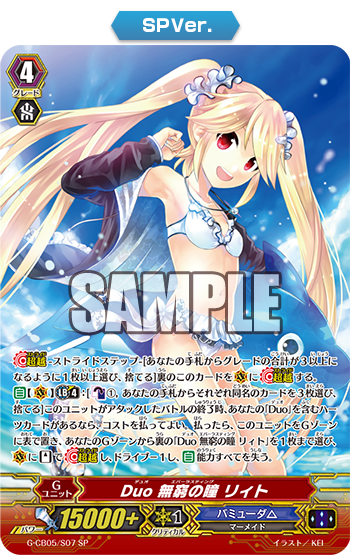 • The 《Bermuda Triangle》 “Duo” Support Card “Duo Sprinkle Light, Prianny”! • The SP Illustration of “Duo Everlasting, Reit”! When a battle in which “Duo Everlasting, Reit” attacks ends, using her Pseudo Stand ability as a G Unit, you can Counter Blast 1 and discard 3 cards with the same name from your hand to return your G Unit “Reit” to the G Zone face-up, then Stride a face-down “Duo Everlasting, Reit” from your G Zone as a new Vanguard Standing. You can Drive Check a total of 5 times with your first attack being 3 and latter attack being 2! By using “Duo Stream Showtime, Paytonya (from “Prismatic Divas”) and “Duo Duo Fantasia, Lamry”, you can add cards with the same name for you hand, meaning you can easily pay for the costs of your cards in your Deck. So aim to apply pressure on your opponent with multiple attacks! And, “Duo Sprinkle Light, Prianny” is a Unit with an ability to change your Vanguard. When your turn ends, you can reveal 2 or more cards with the same name from your hand, ad then search and Ride a Grade 3 “Duo” from your Deck! And, if you revealed 3 or more cards with this effect, you Draw 1 card. When you can’t draw “Duo Temptation, Reit”, use “Prianny” to make sure you can Ride “Reit” for sure! After today, we’ll be introducing more cards from “Prismatic Divas” for “Today’s Card” as well! Please enjoy!